It’s easy to rip on “fusion” cuisine. For every Wolfgang Puck, Ming Tsai or Jean-George Vongerichten there are dozens of chefs who lack the skill and grounding to use the genre’s freedoms wisely. Instead, they take fusion as a license to commit innumerable, unspeakable and inedible culinary crimes. Fusion, though, can be organic. National cuisines aren’t immutable, and as people bump up against each other their foodstuffs tend to fuse. Creole cuisine is one example; Southwestern another. And so it was with Yu Jin, the owner of Myung In Dumplings (4344 Convoy Street), the new Kearny Mesa outpost of a small Los Angeles-area “chain” that was featured in the Koreatown episode of Anthony Bourdain’s Parts Unknown. Born in Northern China to Korean parents, Jin takes mandu (Korean dumplings) that are themselves part of a Chinese-inflected class of Korean dishes and gives them a further fusing. Perhaps the best starting point is with Myung In’s steamed dumplings with pork and shrimp. Essentially a Korean take on sui mai, this version’s shaped a bit more like a “beggar’s purse” and garnished with chives. Their soy-vinegar-chili dipping sauce was the perfect accompaniment. If the Korean sui mai were comfortable, the boiled dumplings with pork and kimchi were less so. The shape was unfamiliar, a rounded package with ridged lips around one side. The flavor profile was different, too, the kimchi bringing an acidity and hint of spice to the dumplings. These, I thought to myself, definitely did not feel Chinese. And yet, despite the distinctive presence of the kimchi, they weren’t exactly Korean either. They disappeared quickly. While the tubular form of the spicy, steamed-roll dumplings (with pork and shrimp) was different, the dumpling’s flavor profile was reminiscent of shark-fin dumpling (yu chee gow). But the chili-paste dipping sauce took it in a new direction. Still more interesting was the mandu guk, a beef dumpling soup with a broth that took on the flavor of the julienned nori seaweed garnish. 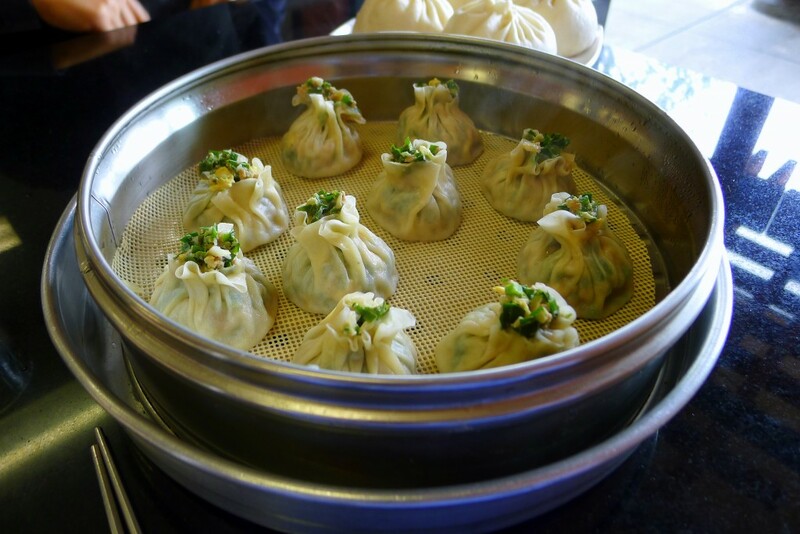 But the glory of Myung In—indeed, the glory of Korean dumplings—is the wang mandu (king dumplings). Myung In offers two wang mandu, one filled with pork and vegetables and the other with pork and kimchi. The former is very good, but the latter is nothing short of great. The wang mandu looks like Chinese char siu bao—large fluffy white buns filled with goodness—on steroids. They are significantly larger than char siu bao and instead of a Western-friendly filling of barbeque pork, the pork and kimchi is far more challenging, layered and subtle. The minced pork provides a savory base, the kimchi a fermented acidity and bit of heat all wrapped in the yeasty bun. It may get the “king” moniker because of its size but it deserves the name for more than that. At Myung In, it is sometimes hard to see where the Korean stops and Chinese starts. Or is it vice versa? Fusion cuisine, like Prog Rock, may have become something of a pejorative term, but when properly grounded and organically tied together the fusion of two culinary traditions need not produce confusion. At Myung In it does not.